Either a work of blatant propaganda or a unquestioned masterpiece. Probably both. Eisenstein's Battleship Potemkin is wonderfully dramatic, what's especially amazing is how much tension can be generated with simple still images in the middle of uproarious action. The original score by Meisel reputedly used cannon onstage! 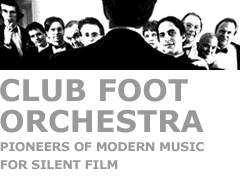 The score, commissioned by WNYC and "Silent Film, Live Music", was written by Richard Marriott and premiered January 21, 2005 at the World Financial Center, New York. The score calls for Violin, Viola, Cello, Contrabass, Trumpet, Trombone, Tuba, Clarinet, Electric Guitar, Timpani and Percussion. Deirdre McClure conducted the premiere. It is a virtuosic score. John Shaffer has featured the recording of the the premiere repeatedly on his radio program "Sound Check."